I'd decided a couple weeks ago that I wanted to make Stella a 'Play Dress-up' Tutu for Christmas. So, we'd made a quick stop by Hancock Fabrics when in Slidell and picked up some Tulle; two shades of purple and white; 4 yards total. And, since we were just hanging out today, seemed as good a time as any to put it together. We'll be going to Target sometime this week and I'll try and find a pink leotard set to go with it. 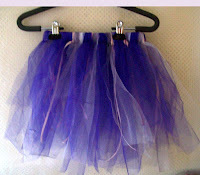 I had planned to make a tutu for Lilly as well, but didn't have enough tulle. I'll get some more for her ... thinking perhaps, yellow and red.